Founded in 1990 as UW Bothell’s Liberal Studies program, the School of Interdisciplinary Arts & Sciences (IAS) is today one of the few non-departmentalized arts and sciences units in the nation. During Autumn Quarter 1990, we enrolled eighty-six undergraduate students; during Fall Quarter 2012, we enrolled nearly eleven hundred undergraduate and graduate students. In 2001, we began to offer a Master of Arts in Policy Studies; in 2008, we launched our second graduate program, a Master of Arts in Cultural Studies; in 2012, we added a Master of Arts in Creative Writing and Poetics. Previously an upper-division and graduate program, we began in 2006 to offer lower-division curricula and to contribute to UW Bothell's first-year program, the Center for University Studies and Programs, now called the First Year & Pre-Major Program (FYPP). Though unique in many ways, the history of IAS mirrors national and international shifts in the landscape of higher education since 1990. IAS is one of a generation of academic institutions seeking to reconfigure higher education, making way for a plurality of scholarly approaches and modes of inquiry. Since 1990, the IAS faculty has purposefully carved out intellectual and curricular territory that honors disciplinary approaches and methodologies, while also valuing research and teaching that integrates across traditional academic fields. We are driven to innovate by our dedication to reshaping education in ways that are responsive to the practical challenges faced by our students and communities, not just the professional demands of the academy. At the undergraduate level, our curriculum promotes problem-based and integrative learning across all of our degrees, starting with the IAS core course, BIS 300: Interdisciplinary Inquiry, and culminating in our Interdisciplinary Practice and Reflection requirement. We encourage student reflection on their education through the development of a learning and professional portfolio that is launched in BIS 300 and completed in BIS 499 Portfolio Capstone. Faculty members and students explore areas of knowledge together as they investigate the academic and practical edges of their fields. We foster in our students curiosity, creativity, and critical reasoning. We prepare our students for the world of work and for further academic training in graduate and professional studies through opportunities in community-based learning, academic internships, and undergraduate research. At the graduate level, our Master of Arts in Policy Studies takes an interdisciplinary and collaborative approach to research and engagement in policy arenas ranging from health and environment to education and human rights. Our Master of Arts in Cultural Studies prepares students for a wide range of career and educational opportunities in arts and cultural fields. Our Master of Fine Arts in Creative Writing & Poetics invites students to develop their creative work through a course of study that encourages exploration and discovery. All three programs provide a unique mix of theory and practice that allows graduates to move directly into careers in policy, cultural, and arts fields or to pursue further education at the doctoral level. There is a lot going on in IAS, so stay tuned. Our history is in the making. 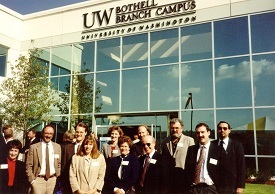 Learn more about the University of Washington Bothell's founding faculty members.